A nice weekend for a change and warm air made ideal working conditions at Mustang Maniac. The job was pre arranged for this weekend and it was all about weather proofing. Well, as good as weather proofing you can get on a fifty year old car! The first job was going to be the inside of door weather rail that holds the rubber strip in place to make it water tight. It was at this point of winding the handle of the driver’s side that we (OK Adam then) was not happy with the feel of it. The driver’s door has had a knock in the past right at the front by where the winder mechanism is located and the door was replaced due to the extensive structural damage inside. These are the pics after all the filler was removed. The window regulator was worn more than expected and Adam detected an unusual binding. In fact it was like watching a robber trying to crack an old style dial safe. He listen to the winder a few times, up and down then again. A decision was made to swap it out but it could be OK for a while. The last thing you want it to start taking the door cards off a few months after it’s all done to pull it all apart to replace the regulator. Now under a no load scenario when it was fitted the wear was not evident to me at least. But once connected to the weight of the window and the restriction of the rails it become more obvious. To me it felt OK, but to Adam it was not good enough. So I was tasked to remove the complete mechanism with the glass in place. A feat on its own! The mechanism came out with a bit of fiddling and loosening of the adjustment bolts. Taking the mechanism to Adam he looked it over and confirmed what he thought. Where the door was impacted it had placed a slight bend on the winding plate which has of centred the spindle to the winder handle. To replace it was a little easier as I could assemble the window scissor arms inside the door. This of course meant that all the adjusting of the windows a few weeks ago would have to be done again. Pictures? Nope – there would be no difference as everything looks the same still, it was all inside the door. The second job was the original first job now, fitting the inside of the door recess trims. We looked over the stainless rails could see that the rails had been over tightened and the metal distorted around the screw holes. These holes would have to be flattened out in order to lay flat inside the gaps. A block of metal was found that would fit inside the rails so that it would become the base of the makeshift anvil. A small piece of cloth was placed over the metal to soften the blows of the small leather faced hammer that would not show any hammer marks inside or outside. This took a fair bit of patience and the end result was pretty good. A dry fit of the rail to the bodywork was fine as we wanted to make sure the very subtle twists to the metal were still where they should be. A layer of sticky foam was carefully laid over the back of the fitting to form a cushion against the bodywork and paint. The rail was lightly screwed into position before we tightened it all up. Next up was the sticky part – Impact adhesive. The rail has a slight lip each side and the weather strip is held in place. There are debates over it was stuck in place or not. I have seen factory original cars where I can safely say that they were stuck in place as well. 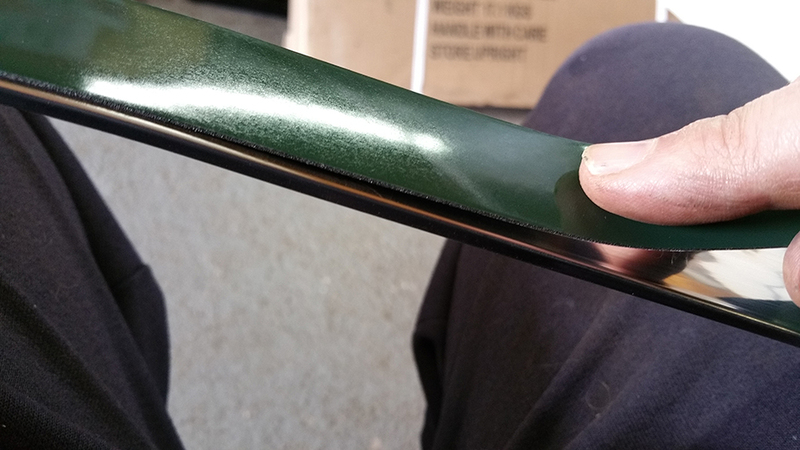 The glue was applied to the rubber and the trim and we started from the front. You get one chance at it and we pulled it off. The fact is as I was helping hold the rubber to stop it twisting and sticking to itself I could get photos at this point. But I have found this picture of somebody fitting theirs, but you get the idea. I will get some of my pics next week. With the strip in place it was time align the door glass all back up again. This took ages as I had to undo it all gain to get the new regulator back in. The tops of the doors has a felt window scraper if you like to help take the damp of the car window and guide the glass from being scratched. There is a thicker strip and a smaller strip that clips into cut outs. In order to make the felt fit I have been allowed to let you into a trade secret in fitting them. Once these things are in they snap in place and area real nightmare to get out without damaging your paint, and you will destroy the felts. Dry fit is best to make sure the clips align with the holes. The top of the window will be right where the felts need to go. The tip is remove the bottom bump stop and wind the window down the extra inch until it’s just below the door skin. Clip the strips in place making sure the chrome is the right way up. There is a about two or three millimetres difference at each end on the felts, if they are upside down they will not but up correctly to the edge of the door. Now raise the window up a little to the correct bottom position and refit the bump stop, the window will be seated correctly between the felts. While we are on the subject of the water, we decided to fit a little more fancy stuff on the car, the windscreen wipers to be exact. 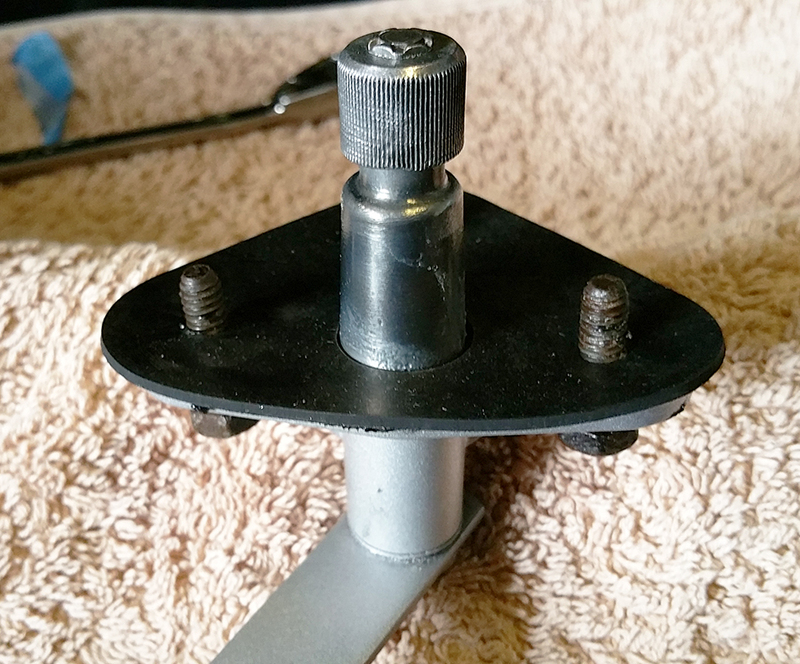 The wiper motor has been tested to work fine and the wiper arm spindles stop in park. Adam told me a horror story of a guy who put new wiper arms on his Mustang and tried them out. The wipers were not in park and the wipers arms were gouged down his hood bending them up in the process. As such Adam is very cautious about this only half presses them on when he fits them. he will lift them off the glass and run the wipers a few times until they settle. Then he will position them correctly. 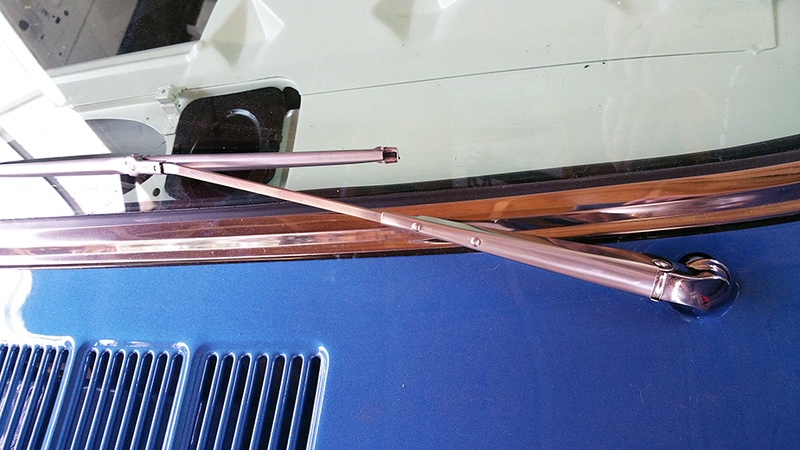 The wiper arms only sit on a splined shaft and pressed on. Better to be safe than sorry. 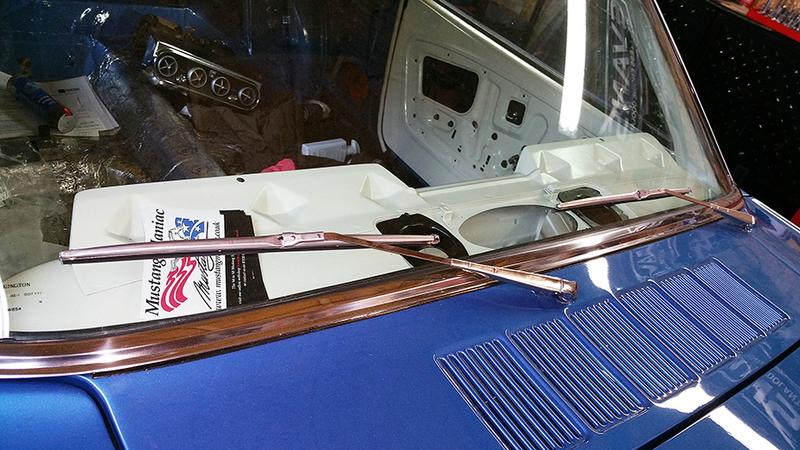 The wiper arms are in stainless and just set the car off a little. They are not correctly positioned just yet though. Next week it could be the trunk weather strip, or rear quarter felts, or dash pad, I will just have to wait and see. This entry was posted in Car, Photo's and tagged Door glass, impact adesive, leather hammer, Mustang, Mustang Maniac, One man and his Mustang, weather strip, window regulator. Bookmark the permalink. I’ve also made the mistake in the past of fitting wiper arm assemblies while the damn thing was not in the park position. In my case no damage to the bodywork as they hit the windscreen frame but they trashed the arms. I too am very careful now when fitting them. Not helped on a Series Land Rover as there is only about 1/2″ leeway from the correct position before the arms hit the frame on full sweep either side. Are they new wiper arms? they look like new. It sounds like you have to be super carefull there then. 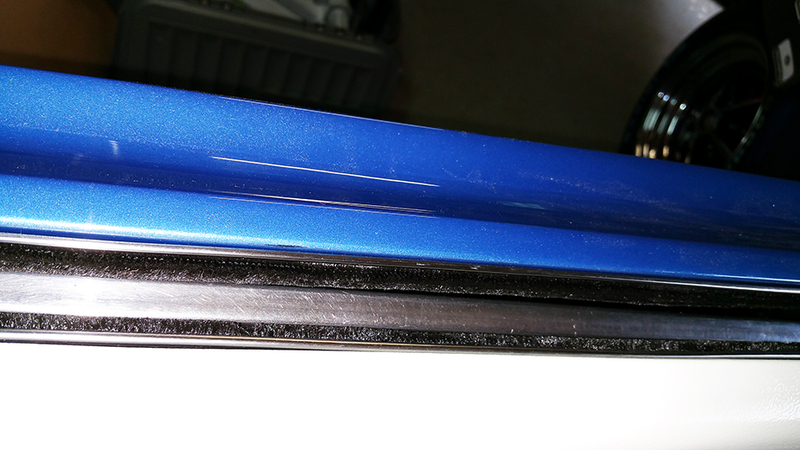 I have even had to bend wiper arms in the past on cars to make the sweep right without clipping the trim. Yep, the wipers arms are new ones. I have a set but not as nice as these. My old set look like cheapo jobs. Love the wipers and how close up your shots are! Thanks Debbie, the wipers seems to make a big difference for some reason. Nice detail work! Keep it up! It’s been a long arduous venture— now it’s “sealed with a kiss”!